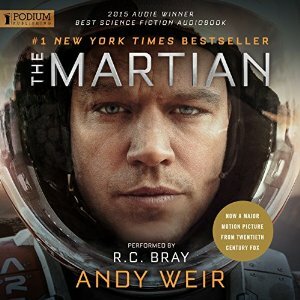 When a team of Mars explorers runs into some problems while on Mars, they think that astronaut Mark Watney has died. The rest of the crew avoid the storm by immediately heading back home to Earth. Unknown to them, Watney is still alive and must survive on Mars alone with meager supplies left behind by the Mars expedition. With his extraordinary resourcefulness, he manages to survive while desperately hoping that Earth will realize that he’s still alive and come to rescue him. This book was as fantastic as everyone says it is. Watney’s struggle to survive is fascinating, and the action moves forward at a steady pace. Yeah, there’s a lot of technical language, which made the book a little slower than I would have liked at times, but it was never so slow that I wanted to stop listening. It was more of an “ok, I get that you’re doing awesome technical stuff, let’s move on.” But those scenes were only paragraph-long. I was a little amused at how much money and time America was willing to put in to save Watney. After all, he was only one person and there are so many people on earth that could have benefited greatly from that money. They could have helped thousands of people instead of just one. I get it. He’s a hero. But he also made the choice to go on a dangerous adventure. The homeless and hungry in America and around the world did not make the choice to starve. Shouldn’t they be helped first? The narration in the audiobook was also excellent. The humorous parts were so well executed that I had to laugh out loud on numerous occasions. I really need to read this. It completely fits into my desire to read more science fiction. Your commentary as well as everything else that I have read makes it sound fantastic. Yeah, you should. If you're interested in starting to read more science fiction, this is a really good place to start. I just read this one too. LOVED IT. Yeah, so do I. It's really rare for that to happen. Can't wait to see the movie on Tuesday!